Turvey Circular Walk at Turvey Walking RouteThe walk crosses the attractive undulating farmland of the Turvey House estate. The picturesque village of Turvey is a fascinating assortment of buildings and it is well worth allowing some time to wander around. 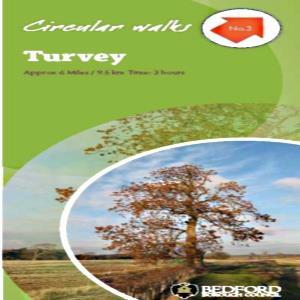 The walk crosses the attractive undulating farmland of the Turvey House estate. The picturesque village of Turvey is a fascinating assortment of buildings and it is well worth allowing some time to wander around. How to get there by car/parking: The village is situated on the A428 Bedford to Northampton road, about 10 miles west of Bedford. Parking is limited within the village although there is a large lay-by to the west of the bridge, just into Buckinghamshire. The Three Cranes pub and Ye Three Fyshes pub have kindly agreed to allow parking for walkers who take refreshment there. Please inform the landlord if you intend to leave your car.